India is advancing international trade deals, but it still hasn’t solved its domestic trade woes. India is a full-fledged member of the WTO and is negotiating a series of bilateral, regional and trans-regional trade pacts with countries in Asia, Africa, Europe and Latin America. However, India’s domestic market trade is fraught with impediments that inhibit the seamless movement of merchandise across its different state and union territory borders. Thus it wouldn’t be wrong to assert that India itself is not a free market area. As a result, it is easier to move merchandise internationally than within the country. This limits growth and employment. India Inc. has often complained about the underdeveloped transportation infrastructure, the complex tax regime that results in cascading taxes, and the over-regulation of inter-state trade with the frequent checks, stoppages and inspections that lead to delays in moving merchandise from one state to another. All these factors add to the cost of doing business in India (more so for the manufacturing sector that the Make in India campaign aims to promote) and escalate the final price of tradable goods for consumers. That, in turn, encourages importation and puts pressure on the balance of payments. A series of market distorting rules and regulations are impeding India’s evolution as an integrated common market. In the case of agricultural commodities, two good examples are the Essential Commodities Act (ECA) and the Agriculture Produce Market Committee (APMC) Act. ECA empowers the government to declare any commodity essential and impose stocking limits which creates uncertainty in the market. On the other hand, the APMC Act mandates the purchase and sale of agricultural commodities in the government-regulated local mandis. So farmers cannot transport and sell their produce to better paying markets that may be located outside their districts or states. Another major deterrent to free inter-state trade is the multiplicity of taxes levied on manufactured goods which has fragmented the Indian market into numerous state level markets. There were some improvements with the introduction of VAT. However the cascading effect of taxes still exists. For instance, the VAT charged by the state on the sale of a product includes the excise duty element levied by the Centre. Similarly, the raw material used in manufactured goods on which the excise duty is levied by the Centre have already had the State VAT levied on them. Simply put, the excise duty is charged on the VAT element and vice versa. Further, the Central Sales Tax (CST), a tax levied on the inter-state movement of goods, is not integrated with the VAT making it ineligible for input tax credit. Separate taxation regimes for goods and services leads to the further cascading of taxes. In addition, variations in the VAT and other taxes across states leads to trade diversion, rate wars and shifts in manufacturing activities based on tax arbitrage. To add to manufacturers’ woes are various entry and exit taxes and formalities required for the inter-state movement of goods. Imagine a manufacturer in Gujarat who sources inputs from Maharashtra and then exports the finished goods to Mumbai. Apart from state and CENVAT taxes, it would have to pay a Central Sales Tax of 2% on the purchase of inputs from Maharashtra. This is like an exit tax on the goods sold to other states. Moreover, CST does not qualify for input tax credit for the Gujarat based manufacturer. On entering Gujarat the inputs will be subject to an entry tax. The finished goods are then exported to Maharashtra for which the CST needs to be paid again at the time of exit (this time collected by the Gujarat Government). On entering Mumbai an octroi (local tax) is levied on the goods. This makes the goods “imported” into Maharashtra more expensive than goods manufactured locally (in Maharashtra). Also the manufacturer in Gujarat is discouraged from sourcing inputs from Maharashtra, as CST, Entry Tax and an octroi would be levied if an inter-state sale is made. Thus, to avoid CSTs the seller might make a stock transfer by setting up a warehouse in the importing state (Maharashtra) and then conducting transactions locally. Apart from this, the manufacturer also has to pay a service tax on transportation charges incurred on the movement of goods. Thus, taxes like CST, the Entry tax and the octroi not only create barriers to inter-state trade but also create inefficiencies in supply chains. To add to the manufacturer’s difficulties are the state check-posts and inter-state regulatory requirements which involve detailed documentation like permits, waybills, tax invoices and delivery notes which lead to delays and increases in the transaction cost. Moreover, these requirements vary from state to state. The Transport Corporation of India Ltd. has noted that road freight volumes are growing at a CAGR of 9.1 percent while the growth of road length lags behind at 4 percent. Vehicles are often stopped at check-posts on state border, resulting to delays. 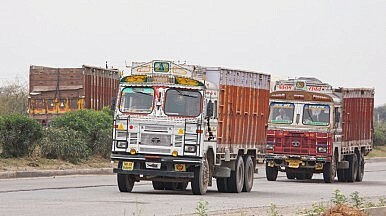 India’s trucks spend only 40 percent of their time on the road. The result is that trucks cannot move more than 20 Km/h on average. It doesn’t help the situation when three-fifth of goods are shipped by road transport compared to just over one-fifth in China. The World Bank estimates that simply halving the delays due to road blocks, tolls and other stoppages could cut logistics costs by 30-40 percent. India spends around 13 percent of its GDP on logistics, which is much higher than many developed countries, where the costs are usually around 7-8 percent, according to a McKinsey report. Poor logistics infrastructure costs the economy around 4.3 percent of the GDP annually. Complex tax laws, unfriendly state borders and poor transport infrastructure have turned India into fragmented sub-markets. This, along with India’s poor record on ease of doing business, discourages investments both domestically as well internationally. A fully integrated market worth $2 trillion with 1.25 billion people could be very attractive for investors to come and “make in India.” Removing the barriers to inter-state trade should be the first step in that direction, as should the implementation of GST. Doing so would enable businesses to reap the benefits of economies of scale and increase the share of manufacturing in the GDP, which has remained stagnant at 16 percent since the 1960s. It would also reduce India’s dependency on the outside world and protect the economy from external shocks. Ritesh Kumar Singh and Prachi Priya are corporate economists based in Mumbai. The views expressed here are their own.